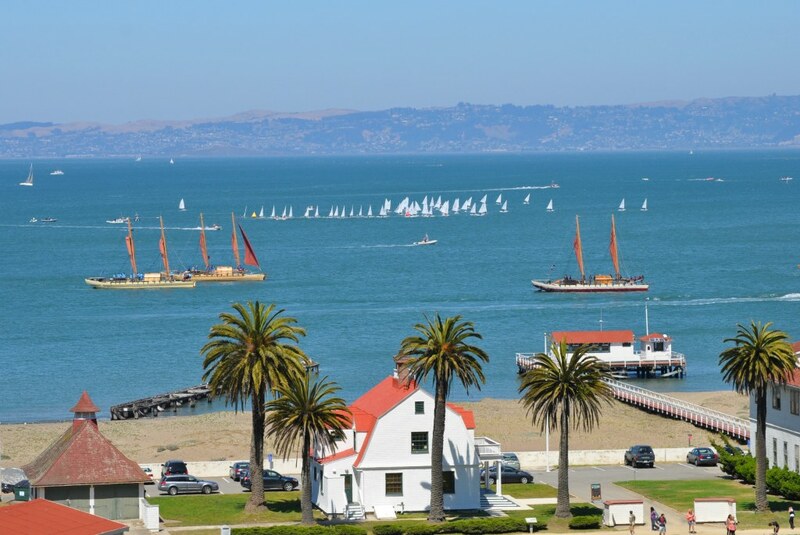 It was a hopping weekend, of course, with the opening races of the America’s Cup World Series in Cascais, Portugal, and that worked, but I am not going to attempt to add to those doings in this space, today. Let me take the day off, instead, by way of pointing out that the six vaca moanas that arrived last week, each hailing from a different island group in the Pacific, have only a short window remaining on San Francisco Bay before they set off for Monterey with their message of concern for our deteriorating oceans. I’m glad they arrived in the sunshine last week, because they certainly didn’t have much sun for their sailing over the weekend. 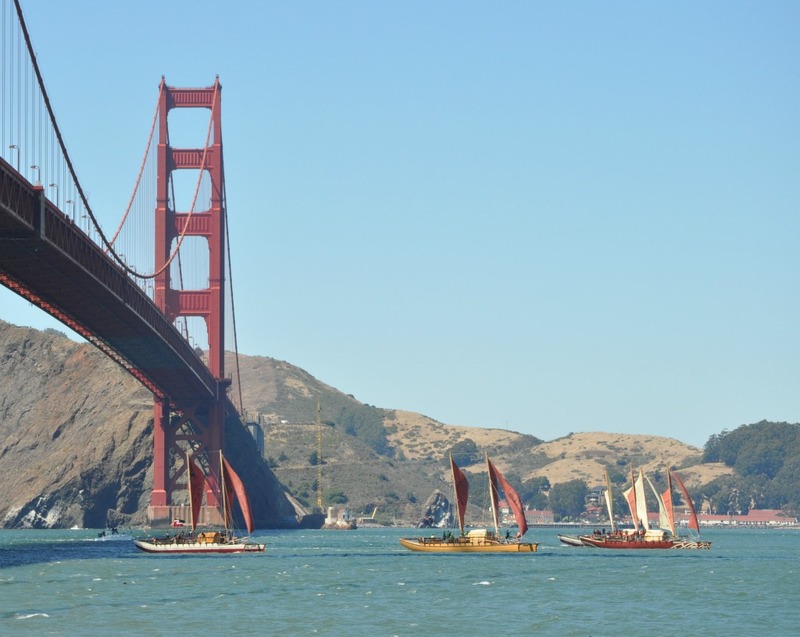 Still on the docket: Cook Islands day from 10 am to 3 pm Tuesday at the San Francisco Maritime National Historical Park. On promise, the Cook Islands canoe, Marumaru Atua, master navigator Tua Pittman, and the Prime Minister of the Cook Islands. 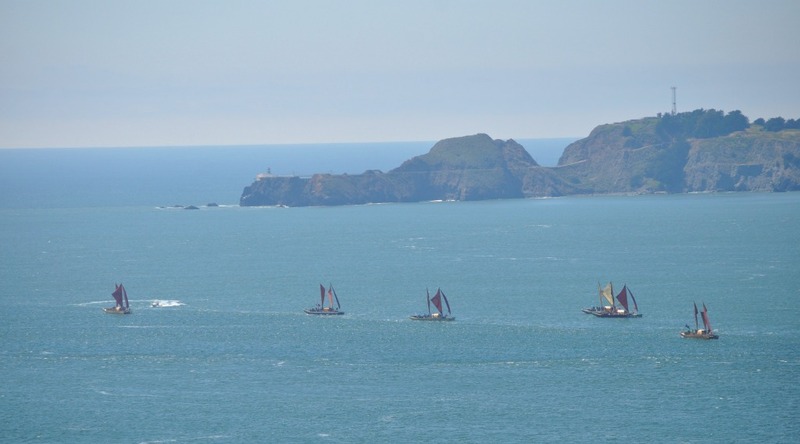 The announcement at Pacific Voyagers addresses “strides they are making to protect one of the Pacific’s greatest ecological treasures,” and there will be speeches, apparently, along with festive drumming and dance. I note that the navigator is named, but not the Prime Minister. But Google quickly discovers that Jim Marurai is the Prime Minister who heads Her Majesty Queen Elizabeth II’s government in the Cook Islands, deep in Oceana and roughly halfway between Hawai’i and New Zealand. From the arrival day, a visual tour. Photos by KL. Arriving in the Golden Gate Strait. That’s Point Bonita in the background, the westernmost reach of the approach to San Francisco Bay . . .
With a ripping flood tide pushing them along, they were quick to make the bridge . . . It was the final day of the Laser 4.7 Worlds, a very international junior event won in the boys’ division by Sammarco Francisco Gonzalez of Spain, with three top-ten finishers, the only country to place more than one in the top ten alongside Belize, Japan, Turkey, Peru, Brazil, Denmark and Switzerland. The girls’ division was international too, but oh man, did Italy’s Cecila Zorzi ever own the thing. 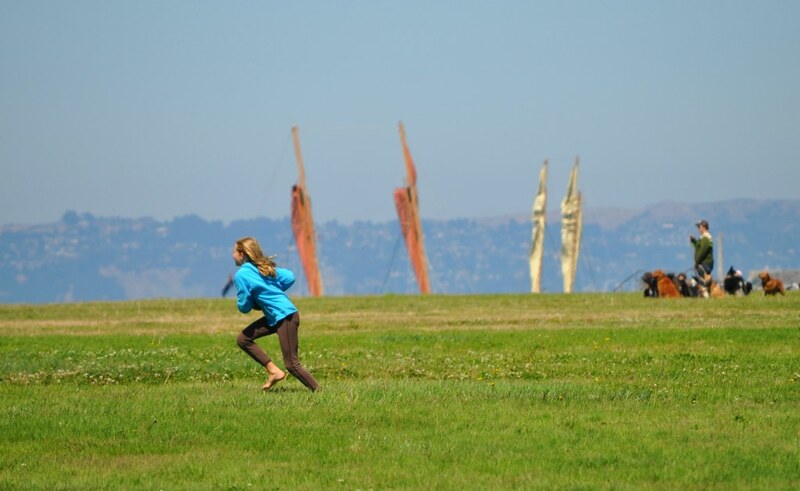 One of the fleets was in its final weather mark rounding as the vacas arrived to a welcome off Crissy Field . . .
And with their sails folded, quickly blended into the landscape and life of the city . . .
A press release about a big collision in the Extreme 40 catamaran competition at Cowes drew my attention, but the video doesn’t impress me enough to share. On the other hand, in this video you get Extreme 40 race commentary while the camera is aimed away at something that, fortunately, you don’t see every day.